Everybody knows what time it is, but nobody can tell what it is. Our evolving Universe has four essential constituents: matter, radiation, space and time. All of them may be measured with great precision. 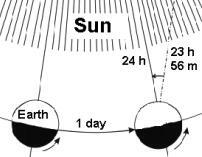 One Day (period of alternation of sunshine and night) is given by the rotation of the Earth around its axis. A solar day lasts about 4 minutes longer than one rotation with respect to the stars (about one degree more than 360 degrees). The centre of the solar disc (true sun) moves on the ecliptic with varying speed - faster in winter, slower in summer. Therefore a fictitious point - mean sun - was introduced by astronomers, which moves with constant speed on the celestial equator. The mean sun and the true sun meet once a year at the vernal point. 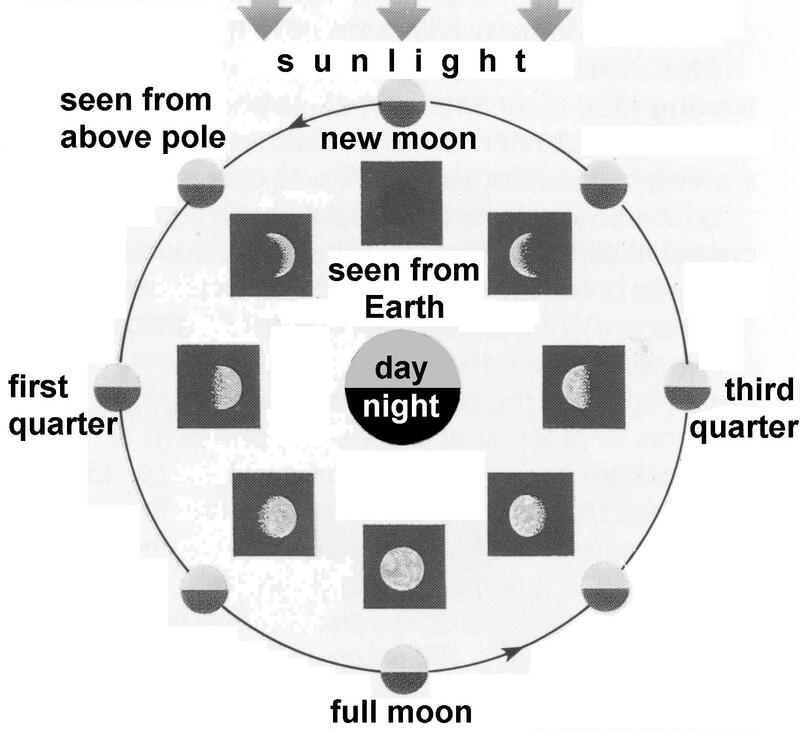 One revolution of the Moon around the Earth (= lunation) was used as a month and its quarter as a week. New moon, first quarter, full moon and last quarter are conspicuous for everybody everywhere and the time interval between them is seven days (one week) and 9 hours. The full lunation (=synodic month) lasts 29,5 days (1,5 day more than 4 weeks). The lunar calendar therefore alternates months with 29 days and 30 days. One revolution of the Earth around the Sun is one year. The rythm of life in the biosphere (= the seasons) is given by the tropical year. 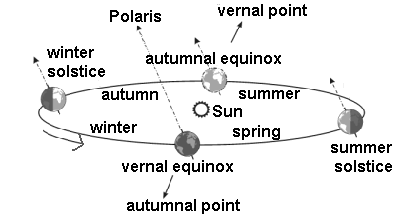 It is the time interval between two transits of the Sun across the vernal point. The vernal point is shifting on the ecliptic towards the west, so that a tropical year is 20 minutes shorter than a full revolution of the Earth (=360 degrees) called a sidereal year). Timekeepers. Days, seasons of the year and phases of the Moon were sufficient forms of time measurement for simple nomadic and agricultural communities. During history devices were developed to improve timekeeping - counting the passage of time. The Chaldeans were the first people who introduced a 12 hour division of the day. They used sun clocks. 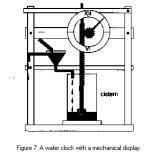 Since then, improved forms of timekeepers followed: water clock, hour-glass, mechanical clock (with balance or pendulum), electrical clock (with a piezoelectric crystal) and atomic clock (with Cesium 133 or other atoms). Our way of life is fully dependent on accurate timing. Science, communication, transportation, manufacturing and other technologies are dependent on accurate clocks. The first atomic clock was constructed in England in the year 1955. 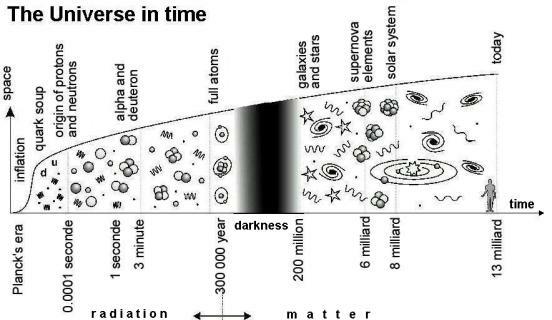 The history of our Universe started with the Big Bang , when time, space, matter, and radiation were created. The first era - the radiation era lasted 300 000 years. The energy of photons prevailed over the energy of matter. Protons and neutrons were formed by fusion of three quarks, nuclei of helium (alpha-particles) and heavy hydrogen (deuterons) were formed by nuclear forces. In cosmological recombination full atoms appeared and the Universe became transparent for radiation. 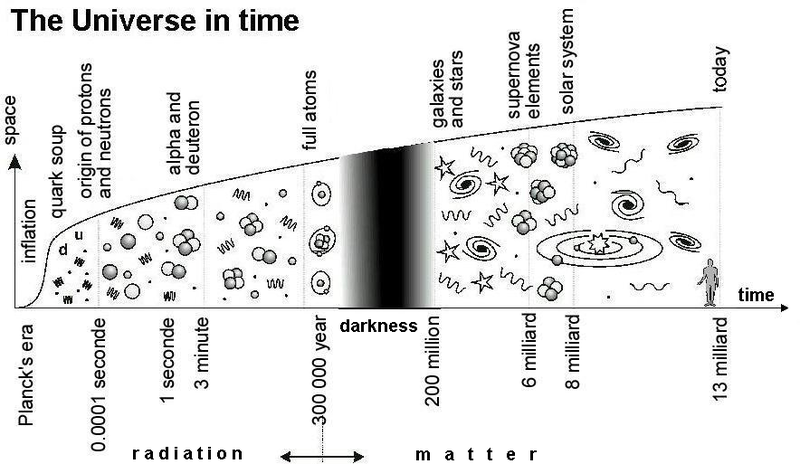 Then light became infrared radiation (by expansion) and for 200 million years the Universe was dark. During the matter era (or stellar era) gravitation formed galaxies with stars. In supernovae, elements were synthesized from hydrogen (nucleosynthesis) and from the solar nebula, gravitation made our solar system. Everything was built up from quarks and electrons by nuclear, electric and gravitational forces. Absolute time. According to Newton (in its Principia ) the time is independent on things and events, which means it is absolute. It is called "duration". 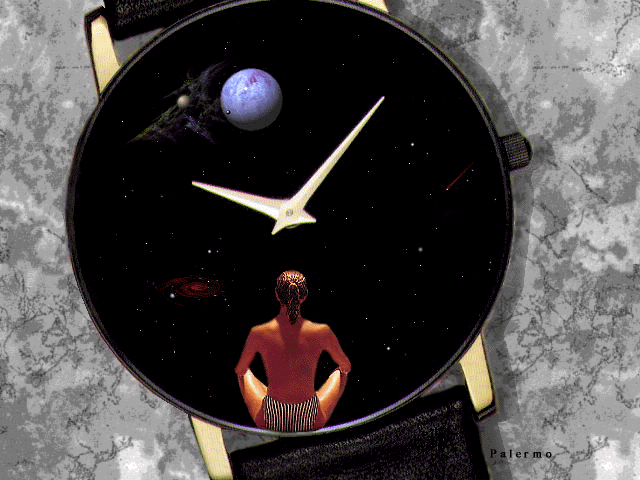 If all matter would disappear from the Universe - it would not influence the absolute time (neither the absolute space). Atomic time is the time using natural frequency of atoms. In most atomic clocks the Cesium atom isotope 133 is used. 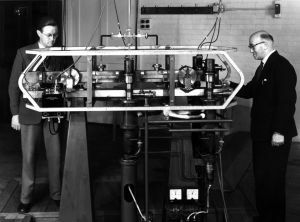 The first atomic clock was built at the National Physical Laboratory, England, in 1955. There are 9 192 631 770 oscillations of the Cesium isotope in one second. In 1967 it was recognized as an international unit of time and replaced the previous second based on Earth's rotation. The frequency of the Cesium atom is very stable (contrary to the Earth's rotation). A good atomic clock is able to keep time with an accuracy of one second in 15 million years. Scientists are working on technology to increase this accuracy to 1 second in 10 billion (ten thousand million) years. JD or Julian Day Number is the number of days elapsed since noon on 1 January 4713 BC. The Julian Date is the Julian Day number followed by the fraction of the day elapsed since the preceding noon. E.g. 2 437 666.50 was the midnight from January 1. to January 2 1962. Mean Sun. A fictitious point on the celestial equator that moves with constant speed eastward and passes through the vernal point simultaneously with the true Sun. 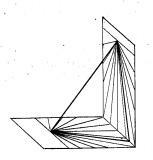 Its angular distance from the meridian determines the Mean solar time. MJD or Modified Julian Date begins at midnight and for simplification from the JD 2 400 000.5 days are subtracted. There are no leap years, no months in JD and MJD, it is a continuous uninterrupted timescale, and as such it is used in history and in astronomy. Relativistic time. 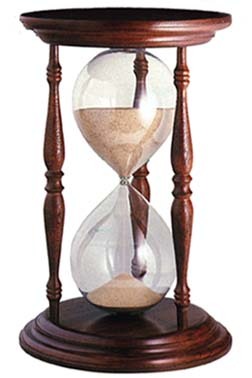 According to the special theory of relativity, every thing has its own time (old wisdom: "Omnia tempus habent"). The measured flow of time of fast moving objects (e.g. particles in accelerators or in cosmic rays) is slowed down. S, Second, atomic second. 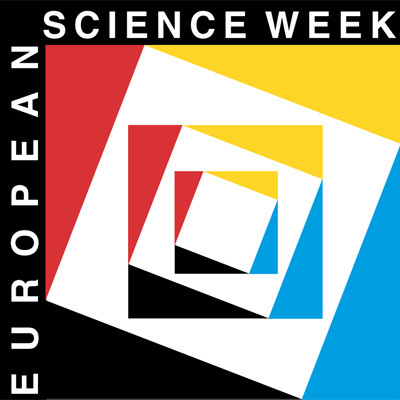 The official definition is: "La seconde est la durée de 9 192 631 770 périodes de la radiation correspondant à la transition entre les deux niveaux hyperfins de l'état fondamental de l'atome de césium 133"
Solar day. 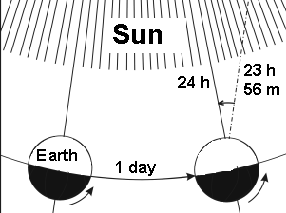 Apparent solar day - time interval between two meridian transits of the true Sun. Mean solar day - time interval between two meridian transits of the mean Sun. TAI, International Atomic time (Temps Atomique International). 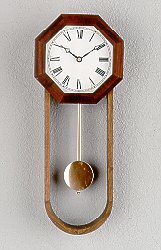 In 1960s the convenient techniques to compare worldwide clocks were developed and an ensemble atomic timescale became possible. A large number of atomic clocks all over the world (today about 350, mostly Cesium clocks) send their data to the Bureau International de l'Heure (BIH), where TAI is computed. It is a statistical timescale. UT, Universal Time is the mean solar time of the Greenwich meridian. It is counted from Greenwich midnight and its unit is mean solar day. It corresponds to the rythm of life on the Earth. UTC, Coordinated Universal Time is the Universal Time (=Earth's rotation time) coordinated with International Atomic Time (TAI). The UTC therefore includes both - the practicality of the Earth's rotation and admirable regularity of atomic oscillation. In difference to TAI, it counts whole seconds and sometimes (if the difference of UT and TAI reaches 0,9 second) a leap second is either added or subtracted.